Ananta Chaturdashi is the 10th and penultimate day of the great Ganesha Utsav or festival that begins with Vinayak Chaturthi. In Sanskrit, 'Ananta' means eternal and 'Chaturdashi' means fourteenth. As such, it falls on the 14th day of the bright fortnight or 'Shukla Paksha' of the Bhadrapada month in the Hindu Calendar. 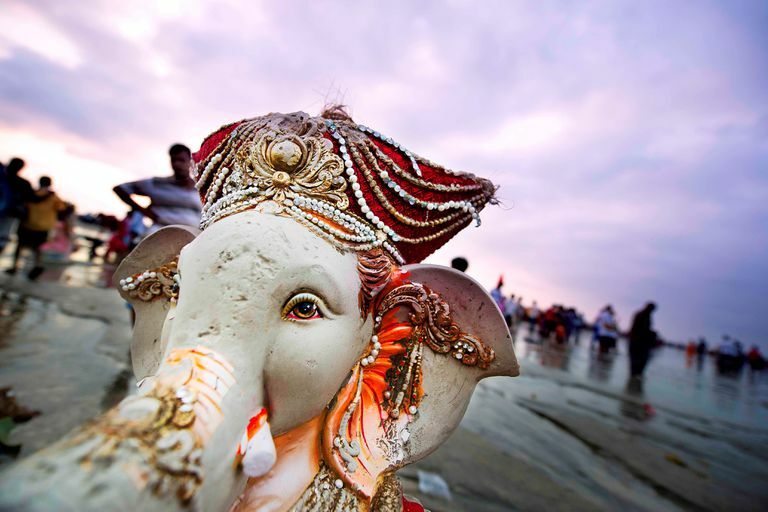 At the end of this day, Ganesha is given a grand farewell and the idols that were installed for the festival are carried to the nearby river, lake or seafront and immersed with a lot of devotion and fanfare amidst incessant chants of the slogan: "Ganpati bappa morya / Agle baras tu jaldi aa" - "O Lord Ganesha, come again next year." It is celebrated across India, especially in the states of Maharashtra, Gujarat, Karnataka and Andhra Pradesh. Although this festival is more popular for its colorful Ganesha immersion processions, Anant Chaturdashi is actually devoted to the worship of Lord Vishnu. In fact, the word 'Ananta' refers to the immortal one, i.e., Vishnu - the Godhead of the Hindu Trinity. Hindus invoke the blessings of Lord Vishnu praying to his image in which he is seen reclining on the mythical serpent Sheshnaga floating on the sea. As in any ritual worship or 'Puja,' the essential items such as flowers, oil lamps, incense sticks or 'agarbatti,' sandalwood paste, vermilion or 'kumkum,' and turmeric, are kept before the idol along with an offering of 'prasad' consisting of fruits, milk, and sweets. Worshippers chant the Vishnu prayer "Om Anantay Namoh Namaha" during the ritual. Ananta Rupey Viniyojitatmamahya Ananta Rupey Namoh Namastute. Most women fast on this day for the wellbeing of their family. 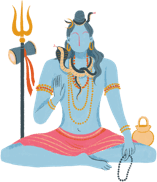 Some men keep a vow to observe the Ananta Chaturthi Vrat or fast for 14 years in a row in order to get the blessings of Vishnu and regain lost wealth. Devotees wake up at dawn, take a bath and take part in the puja. After the fast, they can have fruits and milk and avoid taking salt. "Namaste Devdeveshe Namaste Dharnidhar / Namaste Sarnagendra Namaste Purushottam / Nyunatiriktani Parisfutani / Yanih Karmani Maya Krutani / Sarvani Chetani Mama Kshamasva / Prayahi Tushtah Punaragmay / Daata Cha Vishnurbhagavannantah / Pratigrahita Cha Sa Eva Vishnu / Tasmattavya Sarvamidam Tatam Cha / Prasida Devesh Varan Dasva." There is this tale of a little girl named Sushila, the daughter of a Brahmin, Sumant. After her mother Diksha died, Sumant married another woman called Karkash, who ill-treated Sushila. When Sushila grew up, she eloped with a young man Kaundinya to save herself the torture of her stepmother. On their way to a distant land, while Kaundinya went for a bath in the river, Sushila met a group of women who were worshipping Lord Ananta. Sushila wanted to know why they were praying Ananta and the women told her the purpose of their 14-year vow was to get rich and also achieve enlightenment. Sushila took a cue from the women and decided to take the oath of a 14-year vow. As a result, they became wealthy. One day, when Kaundinya noticed the Anant Sutra on Sushila's left hand, he asked her about the vow. Upon hearing Sushila's story of the vow, he was angry. Kaundinya was sure that they turned rich owing to his own efforts and not as a result of any vow. A furious Kaundinya held her arm, tore the sacred thread from Sushila's wrist and threw it into the fire. No wonder they became very poor soon after this fiasco. This was strong enough for Kaundinya to realize his mistake and the glory of Lord Ananta. As compensation, he decided to go through rigorous penance until Ananta himself appears before him. Despite all his adulteries, Kaundinya was not successful in seeing God. He was crestfallen, went to the forest and asked the trees and the animals if they have seen Ananta. When all his effort went in vain, he prepared to hang himself and commit suicide. But he was promptly saved by a wandering hermit, who took him to a cave where Lord Vishnu appeared before Kaundinya. He advised him to observe the 14-year vow to regain his wealth. Kaundilya promised to observe the fast with all sincerity for 14 consecutive Ananta Chaturdashis, hence giving birth to the belief.